N. Korea newspaper says Pyongyang ‘not thirsty’ for dialogue with U.S.
"To say the obvious, we, who have done everything that needs to be done and own everything, are not thirsty for dialogue with the U.S. 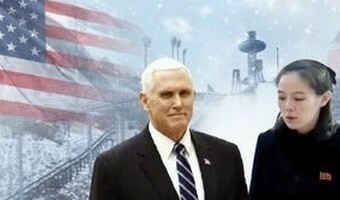 It is the U.S who will feel anxious as time goes by," read a commentary by an individual contributor to the Rodong Sinmun, the official newspaper of the North's ruling Workers' Party.The writer denounced Pence for having an antagonistic attitude toward the North while visiting South Korea last week leading the U.S. delegation to the PyeongChang Winter Olympics. … [Read more...] about N. Korea newspaper says Pyongyang ‘not thirsty’ for dialogue with U.S.